Specialized dictionaries are designed to support the translation of subject-specific texts. Specialized dictionaries ensure a more precise translation of text containing specialized terminology, providing the correct translation for individual terms and collocations, and contributing to a high quality translation overall. 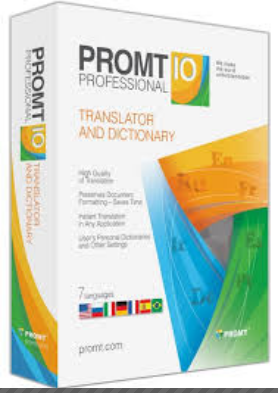 This Multilingual Dictionaries Collection is intended for use with PROMT 10 applications and supports English,Spanish, French, German, Portuguese and Russian.